I have read many books by Adrian Magson and there has not been a bad one yet and he has done it yet again with this latest Marc Portman thriller, the third one in this series. Marc (codename Watchman) is working, as he usually does as a private contractor for the CIA/MI6 and has been sent into Russia to provide hidden, black ops, back-up for a wealthy Russian businessman who has lived in the UK for many years. Leonid Tzorekov was a former KGB officer but is now sympathetic to the West and is thought to be in Russia now with the object of meeting his old friend President Vladamir Putin to persuade him to be more sympathetic and moderate towards the West. There are many, however, who do not want Leonid Tzorekov to meet with Putin and will do anything possible to stop him. Portman goes into Russia in disguise and under cover of darkness and puts an electronic beeper under the bumper of the Russian's car. He hopes this will aid him in following the target less overtly then without it. However, there are others who are considering the same tactic, but for more aggressive purposes. This very exciting, tense adventure kept me guessing right up until the final sentence. I have had the privilege of reading the author's two earlier Marc Portman stories CLOSE QUARTERS and WATCHMAN; I have also read his NO KISS FOR THE DEVIL in his Riley Gavin series and two of his Lucas Rocco stories set in provincial France during the 1960s: DEATH ON THE MARAIS and DEATH ON THE RIVE NORD. 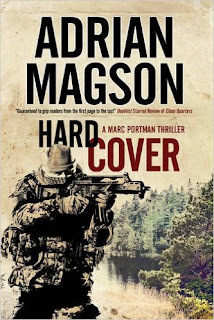 Adrian Magson is a very experienced author and when you open one of his titles you know that the book in question will provide a really interesting and tense plot, and thoughtful, well-described characters. He researches his plots in a thorough and painstaking manner in a similar way to fellow authors such as Stephen Leather and Simon Kernick. The reader can always expect a real sense of tense, nail-biting action and dramatic, page-turning suspense. I look forward to reading any further adventures of Marc Portman and in fact any new books by this very talented and exciting author. Very strongly recommended.